With The Book of Life movie becoming so popular, you might notice that your kids suddenly have an interest in calaveras, or skulls. If they have fall or winter birthdays, they might even ask you to throw them a Day of the Dead or The Book of Life themed party. Can you really blame them? Traditional Mexican culture is vibrant, colorful, and delicious. In our humble opinion, it's about time that they make a fun movie to help teach kids about traditional Mexican culture.Dia de Los Muertos (translated as Day of the Dead) is a 3-day celebration where Mexicans celebrate the souls of departed friends and family. Starting on October 31, families build altars in their homes in order to encourage the souls of their loved ones to come for a visit. On the first day of the celebration, angelitos (souls of departed children) come to visit. On November 1, or All Saints Day, adult souls visit. On November 2, families go out to graveyards to decorate their family members' graves with marigolds and candles.In Mexico, children are raised believing that death shouldn't be feared, but celebrated.OK, now that the brief history lesson is over, let's talk about the fun stuff. 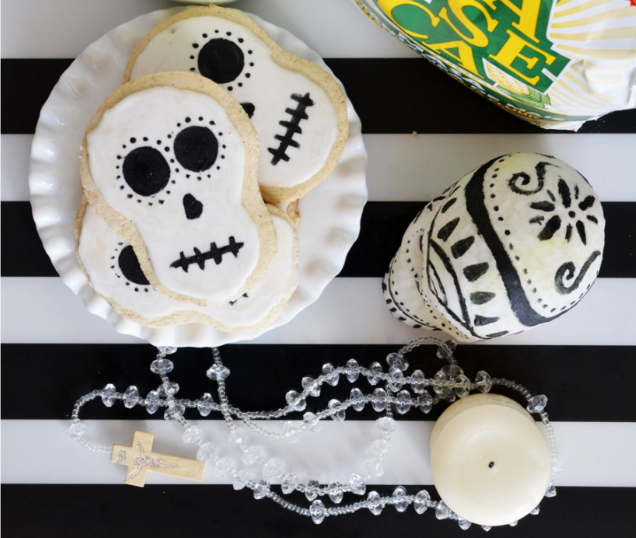 We've gathered together some creative ideas for Dia de Los Muertos themed parties. Most of these ideas are DIY-friendly. Whether you call them pinata cakes or confetti cakes, there is literally no other dessert on earth (that normal people can afford) that will thrill your guests like these. Not only are they completely covered in icing, they have a candy-filled surprise center. It may look incredibly involved, but it's not.Courtney from Sweet C's Designs used some small skull pans to make small skull-shaped mini cakes. Then, she cut them in half and stored some small malted chocolate inside. After covering the cakes with her "fake fondant" she decorates the tiny skulls with colorful icing.Get the full tutorial here! 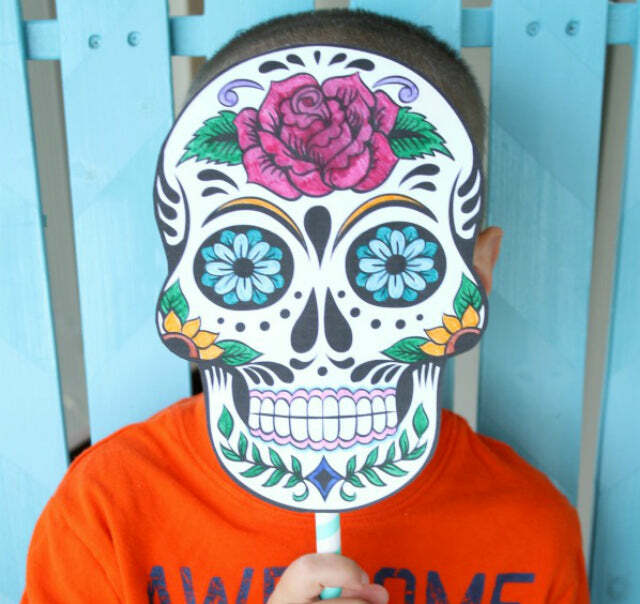 If you don't like the half-face style mask, or you want to get your kids more involved in the party planning process, this calavera mask from Create Craft Love is a great option. Your kids can get in on the action by coloring it before they wear it! You could also print a bunch of these out (hey, they're FREE!) and make it a craft for your kid and all of their friends to do. It can be another thing that your child's guests will bring home and it cost you nothing but printer ink! Bringing out a pinata on Dia de Los Muertos isn't customary, but if your child is having a birthday party then you can't not have one. 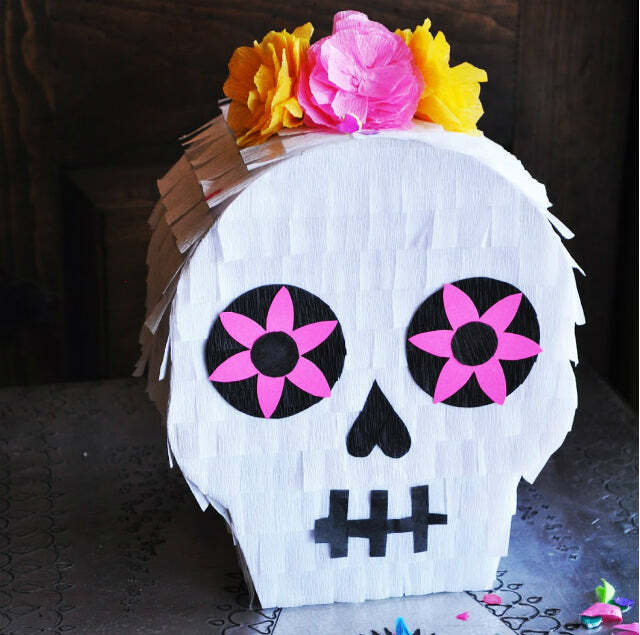 This DIY Sugar Skull Pinata is easier to make than you think. All you need is some cardboard, streamers, glue, tape, and scissors. This pinata is going to look so good that you might not want your kids to beat it. You can get super creative with the face by using colorful paper and fun shapes. 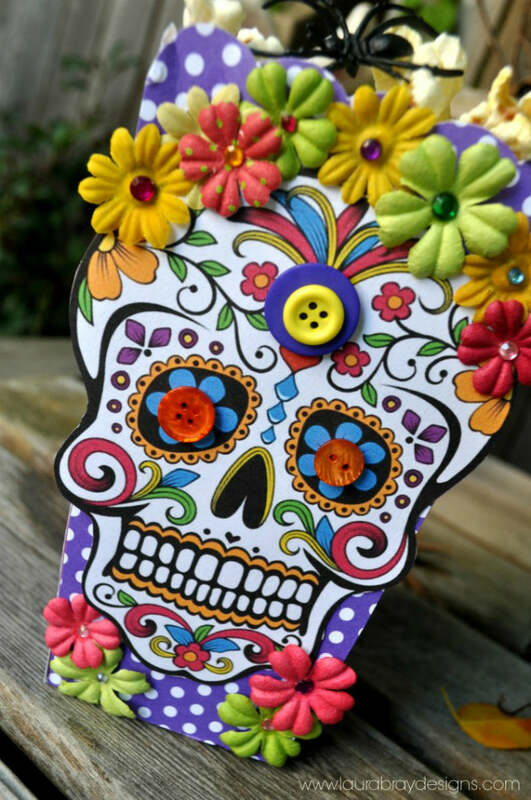 Thought has tons of resources for throwing Dia de Los Muertos parties-from printables to DIY tutorials. 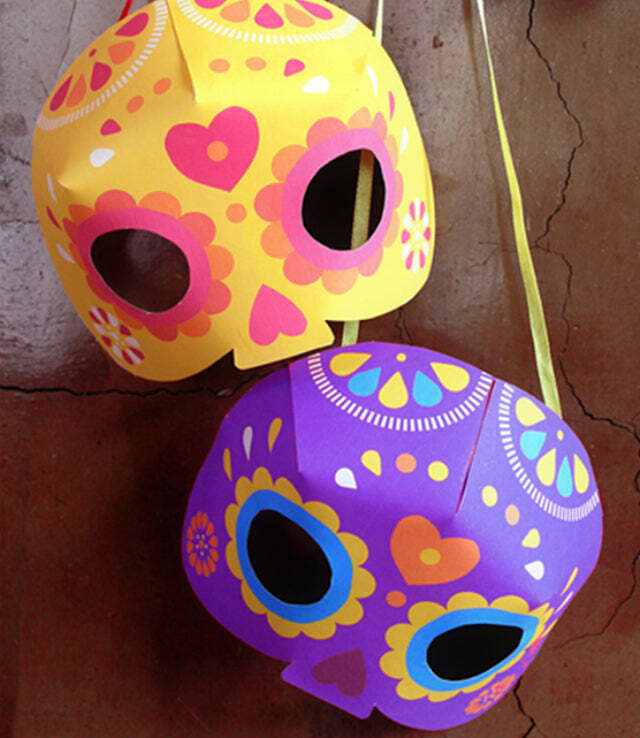 These 3-D Calavera Masks are so colorful and cute, and they're free to print out. The kids will love them, and they'll add a great pop of color to the party. Celebrating Dia de Los Muertos with masks is customary in Mexico, and the traditional masks they wear are called calacas(a colloquial term for skeleton). Get the printable masks here at Happy Thought! 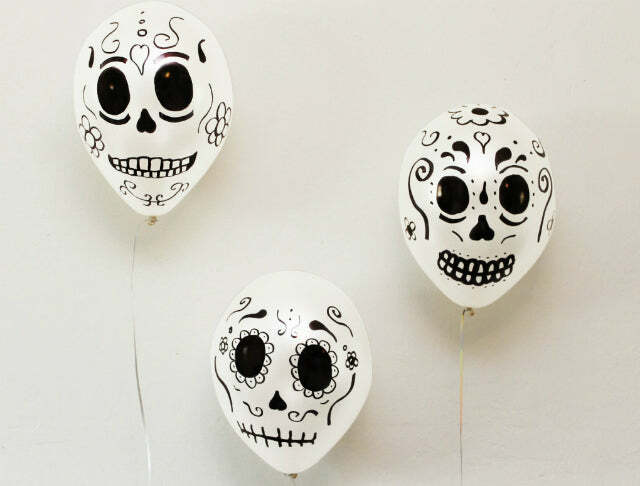 Paula from Growing Up Bilingual simply took a sharpie and started drawing her own calaveras on white balloons. It's such a simple DIY project, but it's guaranteed to make a big impact. We think it would look even cooler with some different colored Sharpies. You could even add some paper flowers to the tops of the balloons. See how they did it and get some extra inspiration here! Marigolds are popular flowers in Mexico, particularly on Dia de Los Muertos, because they're known as the flower of the dead. People place them on loves ones' graves and adorn their homemade altars with them because they're said to welcome the dead and help them on their journey. 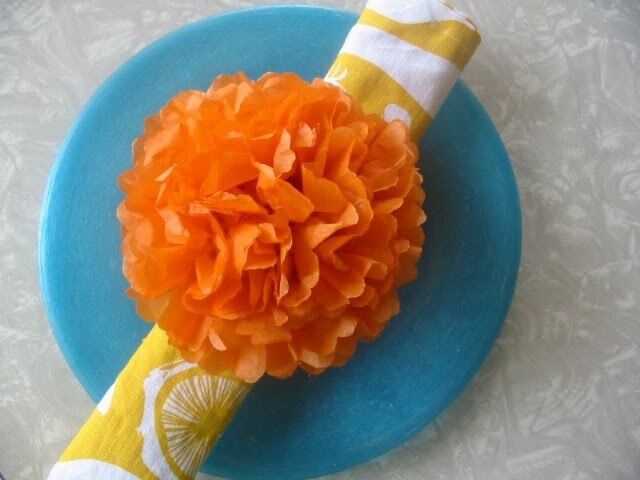 You can make these paper marigolds and use them for a colorful banner or as garnishes for a tablescape, like Sylvia from The Hungry Texan did. 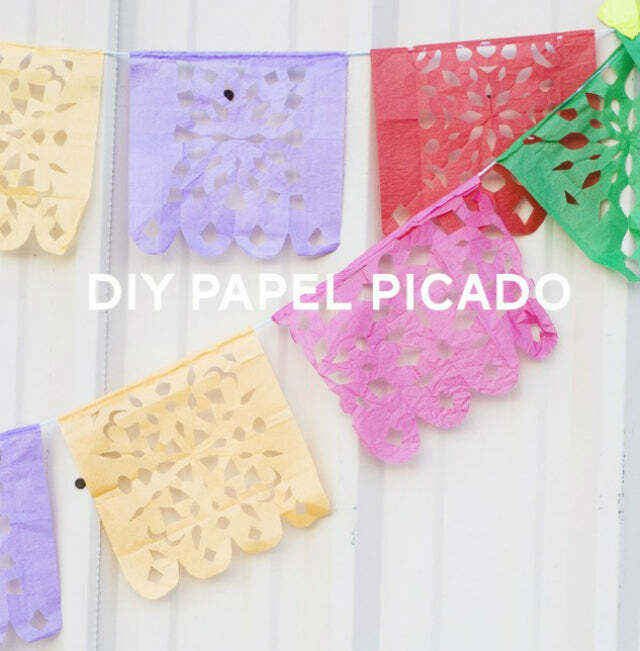 Another fun paper craft used at most traditional Mexican parties and wedding is papel picado, or perforated paper. It's super easy to do on your own, all you need is a bunch of colorful pieces of crepe or tissue paper and some small hands to help you. This is a DIY project you're not going to want to do on your own. If you can't hang these, you can just as easily tape them to the walls and achieve the same effect. 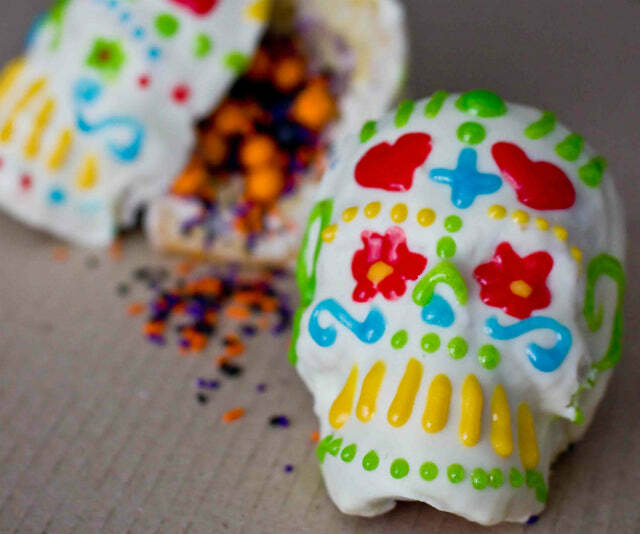 Angie from Little Inspiration made these super cute cinnamon skull cookies using Maseca, a Mexican corn flour. To get the sugar skull details, she used a small paintbrush to paint on the icing and the black face. Angie cut the skull shapes out of the dough using an exacto knife, but there are tons of skull shaped bake ware at specialty and craft stores. These could also be great treats for Halloween. 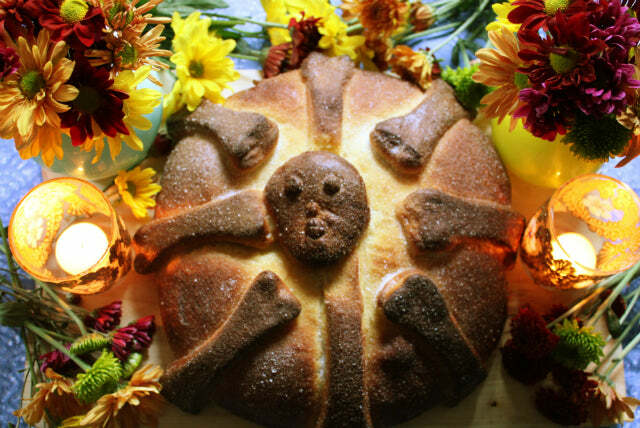 If you're having a Day of the Dead party, you have to make some Pan de Muerto, a sweet bread with decorative bone accents. It's only made in the weeks leading up to Dia de Los Muertos, so it's a very special indulgence. Sofia adapted this recipe from Cocina de La Familia by Marilyn Tausend with Miguel Ravego, and admits that the bone overlay is tricky but the dead bread will be very much alive. Can you believe that this decorative box was originally a popcorn box from the dollar store? Laura from Laura Bray Designs used some scrapbook paper, fake flower embellishments, buttons, and some sugar skull clipart to make these stunning favor boxes. You can fill them with anything from candy to nuts and fruits, like they do in Mexico. 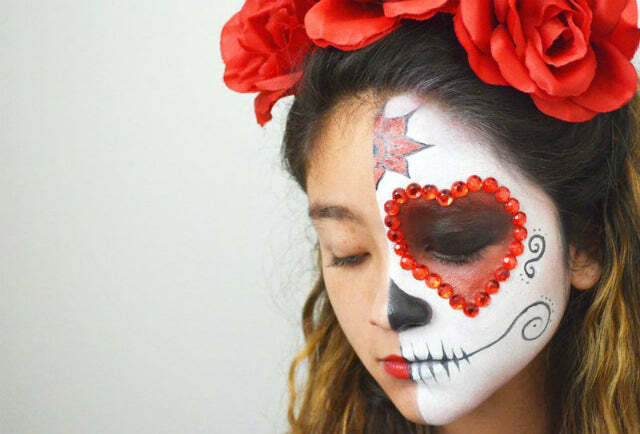 If you want a simple tutorial for how to paint your kids' faces like sugar skulls in the traditional Mexican style, look no further than here. Rachel MÌÁtos from Latina Mom. Me has alot of experience with Day of the Dead face paintings (she was on TV for it once!) and the tutorial she gives on Mom. Me is perfect for kids because it only covers half of the face. That means less time sitting still in a chair!We're not advising that you personally paint your kid's friends' faces. You could probably get away with painting just the birthday boy/girl's face and make it extra special for them. 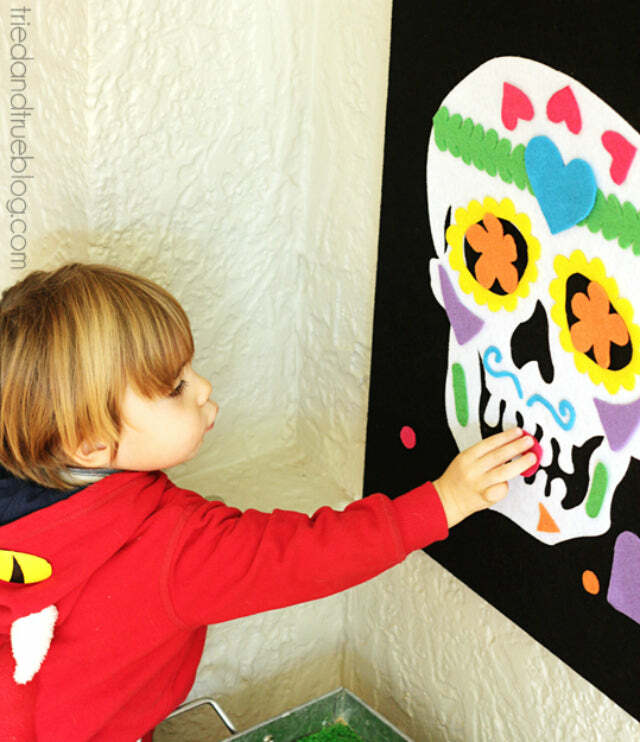 If you're having a party for younger children, this Mix and Match Calavera Art Activity would be a fun project. All you need is a canvas and lots of different colors of felt. Because felt sticks to felt, you won't need any magnets or tape. Vanessa from Tried and True also takes the guesswork out of this DIY project by supplying you with free printables for all of the shapes you'll need to cut. When the party's over, your little one can use it as art for his room or you can save the game for a rainy day. Get the tutorial (and printables) here!